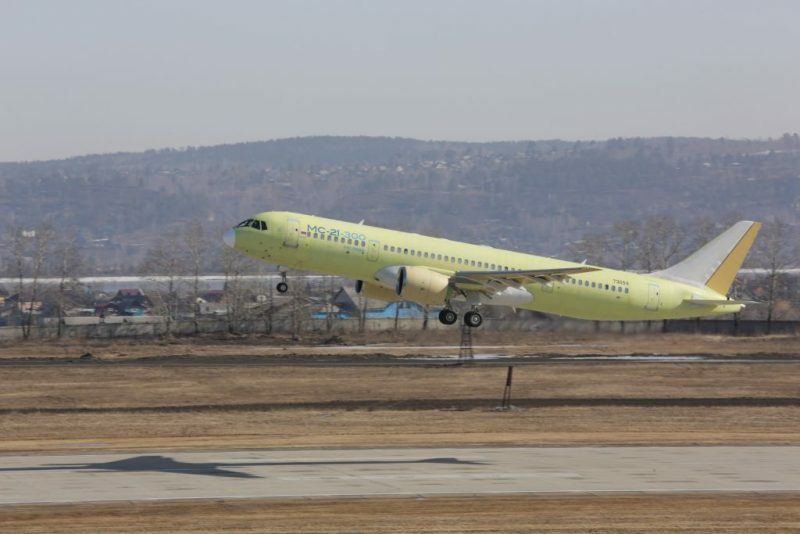 The third prototype of the Irkut MC-21, which Russia says is more than capable of taking it up to Airbus and Boeing, has completed its first successful test flight. 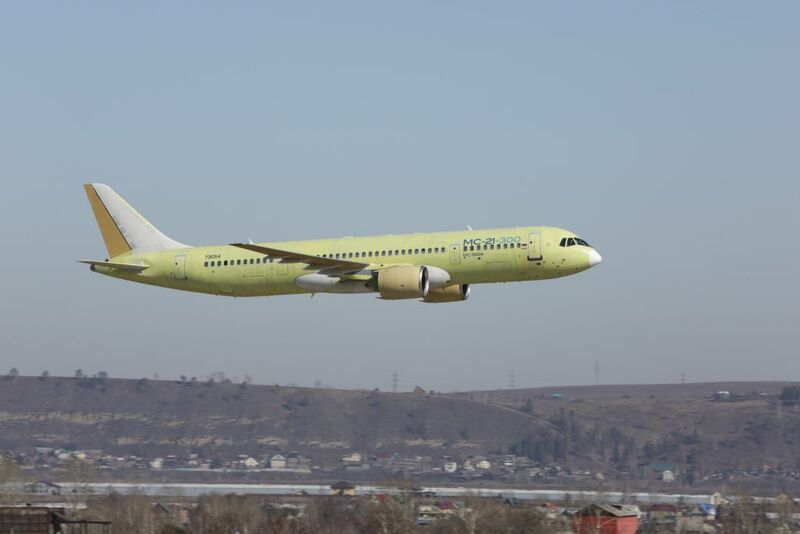 The first Irkut MC-21 to be fitted out with a passenger cabin has completed a successful 90-minute flight. The aircraft is the third prototype to take to the air, just under two years after the first prototype maiden flight in May 2017. The MC-21, which is intended as a direct competitor to the A320neo is also seen as having potential against the 737 MAX, and particularly the MAX 8. Manufacturer Irkut, a branch of the United Aircraft Corporation (UAC) – an aerospace and defence corporation owned primarily by the Russian government – is on the record with a claim that the MC-21 will be both less expensive to buy and more economical to run than its Airbus and Boeing counterparts. There are two MC-21 models. The MC-21-200 is expected to seat about 150 while the MC-21-300 (represented by the latest, third prototype) will seat about 175. Both are two-class configurations. Optional power plants will be the Russian-made Aviadvigatel PD-14 engine or the Pratt & Whitney PW1400G. Initial certification by the European Aviation Safety Agency was undertaken earlier this year with an ambition for full EASA certification next year. All that said, it is recognised that it may struggle for orders in the face of geo-political resistance and concerns over maintenance. Secondly, geopolitical concerns tend to weigh against Russia, both because they will impact sales and because they have led to economic sanctions. However, Air Insight suggested Irkut can achieve its goals to produce and sell more than 1,000 aircraft over the next 20 years, with the majority sold in Russia and other former members of the USSR. It’s intended to be a competitor to the A320 because that’s who the Russians knocked the design off of. What part of the design is a knock off? Dude, it’s a bad thing to make such accusations without any ground. I will pass on the Russian thanks. Yeah and only the Russians, North Korean and possible some Chinese airlines would take them. Could not see any western country looking at using them or risking their brand with what be a risky aircraft in terms of reliability and quality. British Midlands Regional, Brussels Airlines (Belgium), Cityjet (Ireland) and Comlux (Swiss) have operated the Russian Sukhoi Superjet in recent years. Though I believe all are/were leased and all have been returned except for Comlux which I think owns their Sukhois but uses them on Russian operations. The MC-21 is a far more advanced aircraft than the B737 or A320. I wouldn’t be making any quality allegations against the Russians given the revelations of Boeing’s deplorable engineering & certification of the MCAS system. 2 The wing section is very advanced & a Russian State Secret. In consideration Irkut is claiming a 17.8% advantage over the NEO. It’s plausible given the composites.